May 5, 2015 - VPT, Inc. (VPT®), a HEICO company (NYSE:HEI.A) (NYSE:HEI), launched its new VXR Series of DC-DC Converters and EMI Filters today at the annual Association for Unmanned Vehicle Systems International (AUVSI) conference being held in Atlanta, Georgia. 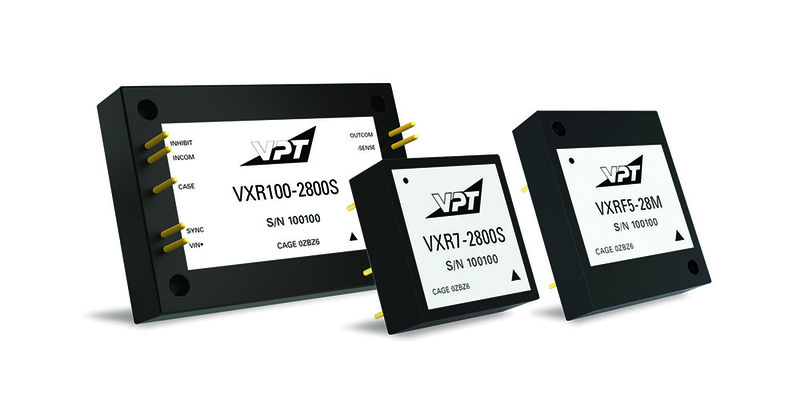 The VXR Series of DC-DC Converters and EMI Filters represent VPT’s most advanced offering of its extensive line of high-reliability COTS DC-DC Converters and accessory products. Available in models ranging from 7 to 100 Watts with an industry leading wide continuous input voltage range from 9 to 60 VDC and transient operation from 6 to 80 VDC, the VXR Series is optimized for a broad range of applications from military ground vehicles to commercial and military aircraft, including the unique power needs of unmanned aerial and ground systems. The VXR Series utilizes VPT’s patent-pending advanced packaging technology. This proprietary encapsulation process incorporates EMI shielding and dual-sided thermal conduction. The integral epoxy encapsulated packaging is highly resistant to chemical, solvent and salt environments and is fully compatible with high-volume manufacturing processes including wave solder, cleaning solvents, high-pressure sprays and aqueous wash. The VXR Series of DC-DC Converters and EMI Filters are available for immediate sale. Individual unit prices begin at $100 (USD) for volume quantities. Please see specific product pages and datasheets for more information.